Plinth/Pylon style LED signs are very popular with schools. 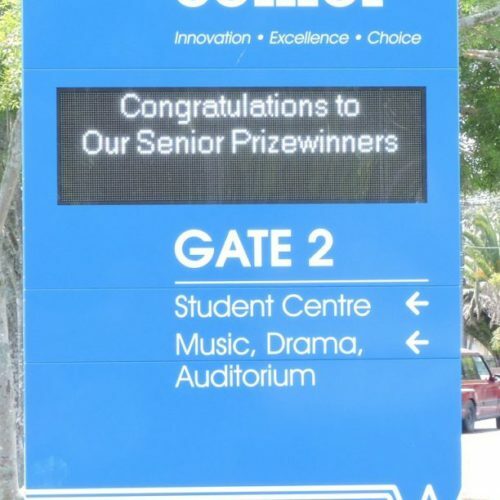 WiPath is the leading supplier of LED signs for schools and other educational establishments in Australasia with hundreds of schools enjoying the benefits of a changeable message signboard, internal information board, video wall or electronic scoreboard. Our extensive knowledge of the requirements of schools enables us to provide you with a high quality long lasting solution. Our experience of the unique climatic conditions in both Australia and New Zealand ensures you get a solution appropriate for your environment and not an off-the-shelf product that often proves unreliable and inappropriate for local conditions. WiPath is the leading supplier of LED signage systems to schools in Australia and New Zealand with over 400 electronic LED signs installed since 2007. Our extensive knowledge of the requirements of schools means we are able to provide you with the most reliable and functional LED signs at the most cost effective price. The plinth/pylon style LED signs are very popular with schools enabling the graphical LED signage to be integrated into a larger branding statement for the school. Light Sensor –To adjust the brightness of the LED screen with changing ambient light. Industrial grade wifi access points for adhoc network.